Ganesha begins chanting and rises into the lotus position, where he is slowed slightly but allows him to travel freely in all directions. 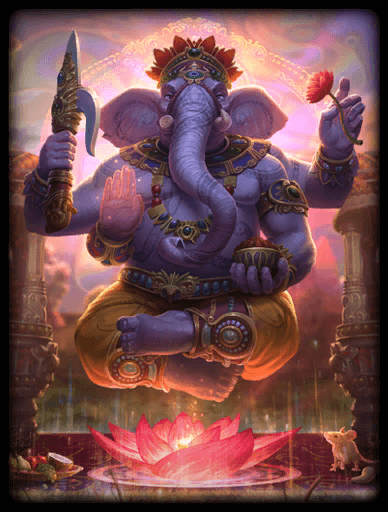 While chanting, he silences Enemy gods in a cone in front of him and increases Physical Protections for all nearby Allied Gods. What would you think of starting with Watchers, Lonos mask and pots? His passive works well with Lonos and you get it finished very fast. 117947 ShadowHuggerD What would you think of starting with Watchers, Lonos mask and pots? His passive works well with Lonos and you get it finished very fast. That's how I build. Combined with Blink/Beads/Med, it's a high sustain start that can allow your team to get minion kills for starter items with stacks while you help them clear and farm. Highly recommend. do you recommd your builds also for conquest ranked ? 117858 DetectiveSKT do you recommd your builds also for conquest ranked ? can i ask what ranking you are in smite ? 117852 DetectiveSKT can i ask what ranking you are in smite ?